Arizal Siddur Kol Yaakov, Part I - weekday prayers, and Part II – prayers for Shabbat and Festivals, with homilies and the kavanot of the Arizal, by the kabbalist R. Yaakov Koppel Lifshitz of Mezeritch (Mezhirichi). [Slavita]: R. Dov Ber Segal and R. Dov Ber son of R. Pesach, . First edition. 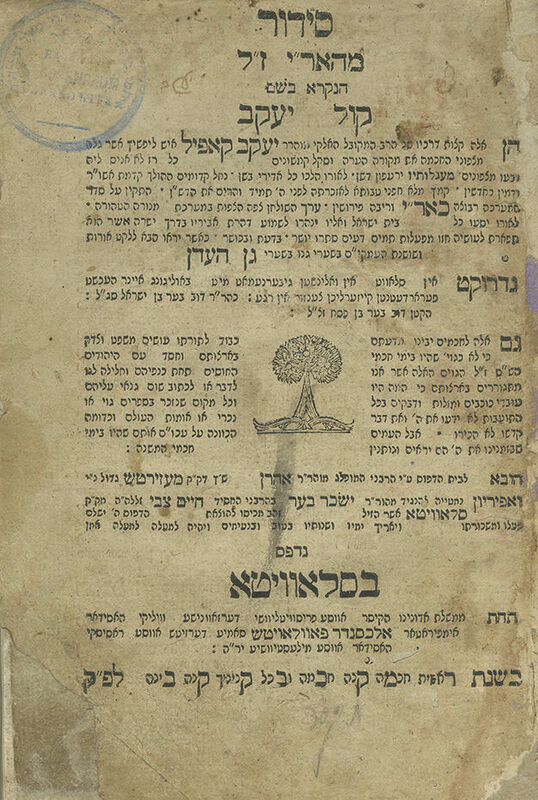 Stamp on the title page: "Itamar son of the holy R. Meir". Rebbe Itamar of Nadvorna (1886-1973, Encyclopedia L'Chassidut, I, pp. 212-213), scion of the Premishlan-Nadvorna dynasty. Son of R. Meir Rosenbaum of Kretshnif and son-in-law of R. Asher Yeshaya of Kolbuszowa (Ropshitz). Already as a young man he served as rebbe in Czernowitz (Chernivtsi), and later in his native city – Kretshnif (Crăciunești). He survived the Holocaust and reached the United States in 1947. He immigrated to Eretz Israel in 1969, establishing his court in Tel Aviv, with many chassidim flocking to seek his blessings. Near the end of his life, he was known as the elder Rebbe of Nadvorna in Eretz Israel. A handwritten gloss (trimmed) on p. 106a. The Kol Yaakov siddur, with commentaries, kavanot, laws and customs according to kabbalistic teachings, was particularly cherished by Chassidic leaders, many of whom would pray regularly from this siddur, retaining it continually on their table, including the Maggid of Kozhnitz (Kozienice), the maggid R. Mordechai of Chernobyl, the Arvei Nachal and R. Avraham of Tshechnov (Ciechanów). Some of them even wrote glosses in the margins of the siddur. R. Asher Tzvi of Ostraha writes in his approbation to the siddur: "I have heard that the holy Baal Shem Tov saw this siddur and deemed it fit". The kabbalist R. Yaakov Koppel of Mezeritch also composed the kabbalistic work Shaarei Gan Eden (Korets, 1803). The title page of the latter states that a reliable source related how when this siddur was brought before the Baal Shem Tov, he read a few verses from it, hugged and kissed it, expressing great reverence for it. The scholars of Mezeritch likewise describe in their approbations the veneration the Baal Shem Tov displayed for this siddur. R. Levi Yitzchak of Berditchev (Berdychiv) praises the author in his approbation: "He is already renowned amongst the Jewish people as a reliable kabbalist, whose words all emanate from Divine Inspiration". R. Yaakov Koppel's books are adapted and edited compilations of the writings of the Remak, R. Chaim Vital and R. Yisrael Sarug, with the addition of his own novellae. Complete copy. , 156; 134, 146-153, 155-188 leaves. 20.5 cm. Some blueish leaves. Condition varies. Many leaves in good-fair condition. Worming and marginal tears to title page. First and last leaves in fair condition with wear, tears and worming, slightly affecting text, repaired. Stains. Dampstains. Worming, affecting text in several leaves, some repaired. Some leaves possibly supplied from other copies. New leather binding.